I commend Furlong and Keefe for including a section on justice and am thrilled restorative justice is acknowledged (p.119-123). It seems they took our submission, under the umbrella of the Vancouver Association for Restorative Justice, seriously! Here is my summary of this section with quotes from their report. On June 15, the downtown core became a “stadium” to about 155,000 people. By the end of the game, things quickly disintegrated into a full blown riot. 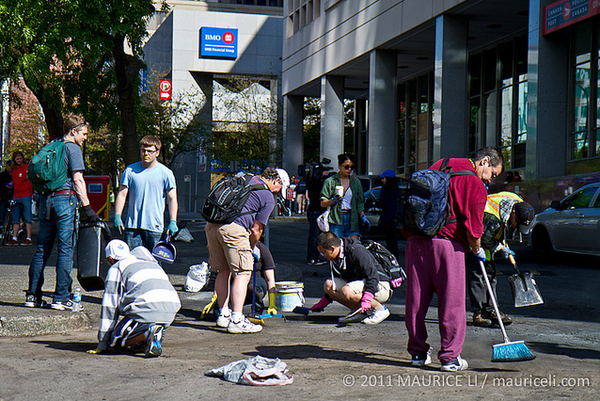 The morning after the riot, people from all over came downtown to help clean up the mess and to show support to those affected. Furlong and Keefe dedicate their report “to those people who took back the streets”. This community response is in itself a form of restorative justice. The clean up and the review are part of a necessary process of restoration. What about the offenders? The criminal justice system is seen as too slow, too weak and, most importantly, too impersonal. “Accountability is most powerful when an individual fully understands the effects of their actions on other people”. And it works: “a great deal of evidence that people who go through restorative justice are less likely to re-offend and that more victims of crime attain closure and have a higher level of satisfaction”. “In designing this process the Attorney General should consult recognized experts on community justice, the judiciary, affected businesses and residents …” (#40).